Email prioritization is a big challenge for sales people across the world. When you deal with a huge database of leads and contacts, it is very likely that you forget to respond to emails or forget to follow up with a customer after receiving an email. SalesInbox is designed to ensure that none of this happens. Following are ways for you to automate categorization of priority emails into folders, create email reminders and a host of other actions. To make email prioritization easier, SalesInbox lets you categorize emails into custom folders and also apply labels to emails. This will help you ensure that you read and respond to emails that you consider important.The difference between regular email clients and SalesInbox is that, while other email clients lets you filter emails based on email parameters (such as Sender, To/CC), SalesInbox lets you filter emails based on email as well as sales parameters. For example, you can filter emails addressed "to you" from customers with "deals worth more than 30000 USD" and categorize them into a folder called "Top customers." This will go a long way in helping you manage your emails efficiently. 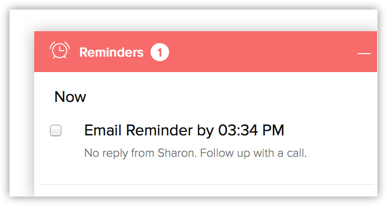 In addition to folders and labels, SalesInbox lets you create automated alerts so that you respond to customers' emails on time. This can also be done the other way round. When you send an email to a customer and he/she has not responded for a long time, you will automatically receive an alert so that you can follow up on the email. If there are some routine tasks to be executed after receiving an email from a specific kind of customers, you can automate the assignment of such follow-up tasks on receiving the email. Zoho SalesInbox not only allows you to receive and send emails but also measure the effectiveness of the emails sent. As part of email insights you will be able to receive email analytics, track email template performance, track email response and a lot more. To know more about how to access email insights, refer to this guide>> Email Insights. 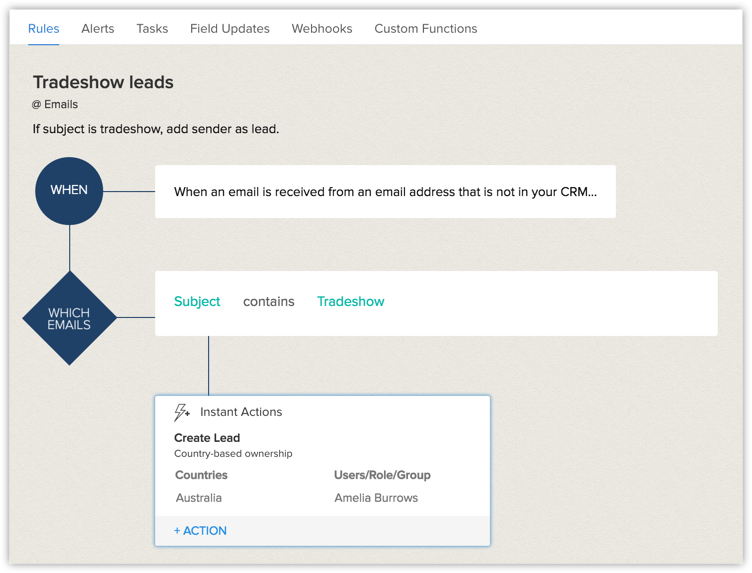 Zoho SalesInbox also lets you convert email recipients into leads and contacts automatically. This can be achieved by using the workflow rules in Zoho CRM. In your Zoho CRM account, go to Setup > Automation > WorkflowAutomation. In the Workflow Rules section, click Create Rule. 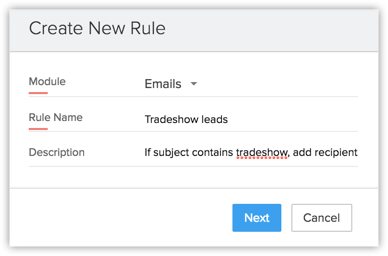 In the Create New Rule popup, select the Module as Emails, enter a Rule Name and Description. This is because that is the only instance when the rule will be executed. 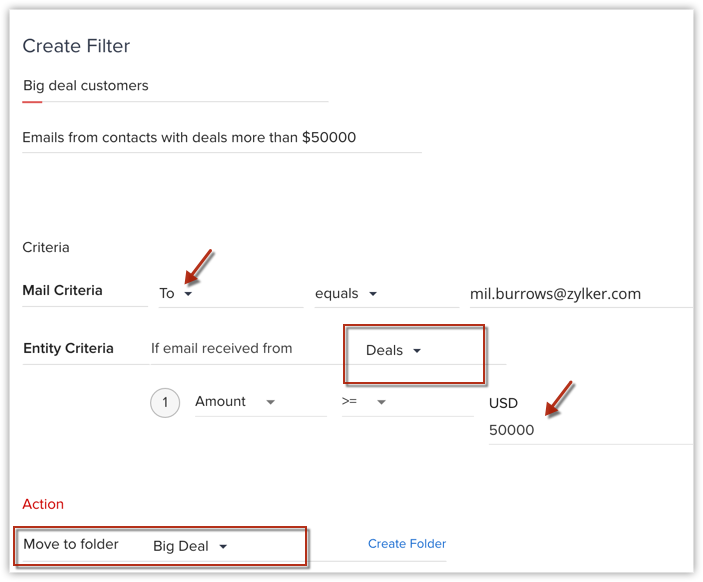 For the Which Emails section, enter a criteria to define which emails should be filtered in order for the recipients to be added as leads/contacts. Click Instant Actions and click Create Record. The only instant action here is to create a record. In the Create Record popup, specify the Record Type as Lead or Contact. This way, whenever you receive emails that satisy the criteria specified in the Which Emails section, the recipients of those emails will be added as a lead or contact as specified here. Specify the Record Owner for leads/contacts thus created. You can select among User and Role. It is mandatory to select a user/s to whom these records will be assigned. You can also assign records based on the region/country. To do this, select the Assign based on country option from the dropdown list. In the Countries section, select the country and select the corresponding User/Role for that country. Once you have reviewed the rule and certain about the criteria and actions, click Save.